A unique aerial view of a car pulling out of a typical Arizona neighborhood residence. Phoenix suburb. A unique aerial view of a truck pulling out of a typical Arizona neighborhood residence. Phoenix suburb. A truck drives past homes in a typical Arizona neighborhood. Phoenix suburbs. A flyover aerial establishing shot of a typical Arizona residential neighborhood. Phoenix suburb. A rising aerial establishing shot of a typical Arizona residential neighborhood. Phoenix suburb. 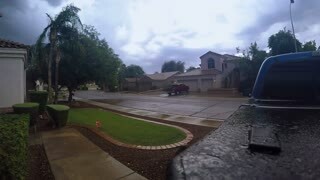 An establishing shot of a summer storm hitting a typical Arizona residential backyard in a suburb neighborhood of Phoenix. Shot at 60fps.